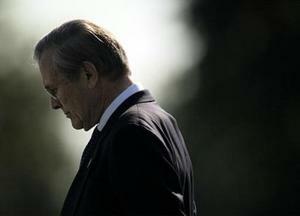 Thank you for your service to our country, Mr. Rumsfeld. Best wishes for you, your wife and family in the next phase of your life. From Wikipedia: Rumsfeld is the oldest person to have held the position, and he was also the youngest when he served as the 13th Secretary of Defense from 1975 to 1977 under President Gerald Ford. Rumsfeld also served in various positions under President Richard Nixon, as well as four terms in the United States House of Representatives, and as U.S. Ambassador to the North Atlantic Treaty Organization (NATO) (1973–1974). I tried to find a picture of Rumsfeld helping in the aftermath of the Pentagon attack on September 11th, 2001, but no luck. I recall seeing TV coverage of Rumsfeld helping to transport wounded people to safety, but I didn't find any such photos on Google. "He is a remarkable man, very capable and intelligent. Years ago he began conceptualizing the need for a quick response military capable of fighting terrorism. He anticipated this threat long before the politicians cared to deal with it and the public became interested in it. Silly political and media criticisms aside, there may be serious and intellectual disagreements by, between and among military types over the Rumsfeld vision but he is a great American who when called, served. And he served with style in the face of ignorance, and in the face of institutional intransigence, and in the face of a media unconcerned with the real problems facing the military. He gave it great effort when he could have been home enjoying the fruits of a lifetime of labor. God bless him." Victor Davis Hanson has praise for Rumsfeld: Vaya con Dios, Rummy! "They will either succeed in changing our way of life or we'll succeed in changing theirs."